Distillerie Neisson in Le Carbet, Martinique was founded in 1931 by brothers Adrien and Jean Neisson and the rum distillery is still family owned and operated. 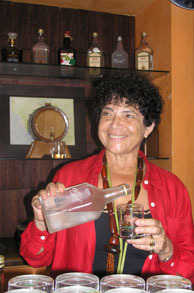 While I was in Martinque in April 2006, I visited the Neisson Distillery and met with Mrs. Claudine Neisson Vernant and her son, Grégory Vernant. Their story is an interesting one; Adrien Neisson bought the factory and sent his brother Jean to Paris to study chemical engineering. When Adrien died in 1971, Jean took over the business until his death in 1986, leaving his knowledge and the business to his grandson Grégory, who at fifteen years old was too young to run the company. In order to keep the business in the family, Mrs. Neisson Vernant, a Paris-educated medical doctor, took over the company until he finished his studies, becoming the only woman to run a rhum (French spelling) distillery in Martinique. I bestowed her with the title of "La Reine de le Rhum" or "Queen of the Rhum." The Neisson Distillery is the youngest of the Martinique distilleries. In 1900 there were 120 distilleries, today there are 9 distilleries and 14 brands. Neisson, run by Mrs. Neisson Vernant and Grégory, who is the Master Distiller, is the only distillery that never closed during World War I and II, and in a time when most of the distilleries are commercially run, they hold the impressive distinction of being one of only two family owned and operated distilleries. Unlike other areas that make rum from molasses, Martinique uses freshly squeezed 100% sugar cane juice, before any sugar is extracted. Neisson bears the proud designation of AOC (Appellation d'Origine Côntrollée) on the bottle, and is called rhum agricole. What that means to consumers is that the sugar cane is carefully harvested, processed, fermented, distilled and bottled in Martinique according to strict government guidelines. If it doesn't have AOC on the label, then it is not rhum agricole. Neisson Rhum products are handcrafted artisanal rums, using machine and hand-cut sugar cane that is "cut green" (non-burned), is immediately delivered to the factory after being cut, and is crushed within 3 hours. The resulting "vesou" is then slowly fermented for 72 hours to allow for rich aromatic development, distilled in a copper "Savalle" column to high alcohol concentration (75% abv), reduced to 69% abv with pure water, transferred to stainless steel barrels where it rests for 3 months, followed by 2 more reductions to produce 50% or 55% abv, and then the white rum is bottled. Their Élevé Sous Bois is aged for 18 months, and their old rums are aged for at least 4+ years in French oak barrels. Although Distillerie Neisson has a special collection of rums available in Martinique, Edward Hamilton, known as the Ambassador of Rum, of Caribbean Spirits, Inc. imports Neisson Rhum Agricole Blanc, Neisson Rhum Agricole Élevé Sous Bois and Neisson Rhum Agricole Réserve Spéciale, so if a trip to Martinique isn't in the immediate planning, you need not wait to experience these luxurious rums. Neisson Rhum Agricole Blanc, 50 % abv, won the Best White Spirit of the Year in 2005, and is clear unaged rum, with a wonderfully fragrant, almost perfume-like floral and sweet vegetal nose, with a sweet fresh cane finish. Neisson Rhum Agricole Élevé Sous Bois, 50% abv, is a golden color derived from spending 18 months in 20,000-liter new French oak vats. It has fresh sugar cane aromas, as well as vanilla and a hint of spice, with a lasting finish. The Neisson Rhum Agricole Réserve Spéciale, 42% abv, is a blend of rums aged up to 10 years in French and American oak barrels. This deep gold rum has rich dark fruit, roasted nuts, as well as toffee and caramel aromas, a balanced body and vanilla and spice on the delightfully lasting warm finish. Cocktail ingredients should complement without masking the flavor of this quality rum. Although you can enjoy Neisson Rhum Agricole Blanc in a traditional Creole Ti' Punch (Ti' is a Creole word for petite), it does lend itself beautifully to crafting tempting cocktails. 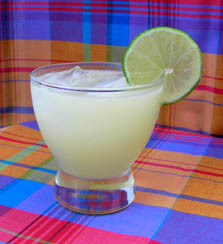 In a small glass, add the cane syrup, squeeze a small piece of lime over the syrup, add the rum, and stir with ice. Luxury Experience's Lemon Cashew Tree combines Neisson Rhum Agricole Blanc, tropical cashew juice, equal parts of fresh lemon and lime juice, and Fee Brothers Lemon Bitters for a refreshing, sophisticated cocktail. In a shaker can, add ice, and all of the ingredients. Shake well, strain and pour over fresh ice in a rocks glass. Garnish with a slice of lime. Martinique is famous for its rum and for its bananas, which is why I created this cheesecake recipe celebrating both of these Martinique products. The result is a smooth, rich cheesecake with a delicious banana, brown sugar and rum topping. Process ingredients until combined. Pat the crumbs on the bottom and sides of a 6.5-inch x 3-inch diameter (16.51cm x 7.62 cm) spring-form pan. Chill the graham cracker crust in the refrigerator while you make the cheesecake filling. Place all of the ingredients in a food processor and process until smooth. Do not over process or the cheesecake top will break. Pour the filling in the crust. Bake at 350° F (177° C) for approximately 50 minutes or until the cheesecake is set but not browned. Remove from the oven and cool on a rack for 20 minutes, and then refrigerate for several hours or overnight. 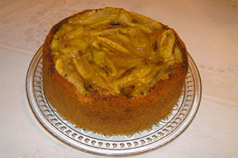 Just before serving, create the Bananas "Neisson" Foster topping, and serve while the bananas are still warm. In a large skillet, melt the butter and brown sugar, add the bananas and sauté for 4-5 minutes until bananas are tender. REMOVE THE PAN FROM THE HEAT; add the rum, and CAREFULLY place a match near the pan to ignite flames to flambé the bananas. The flames will extinguish themselves as the alcohol burns. Carefully spoon the warm bananas over the top of the cheesecake and serve. Visit Distillerie Neisson when you are in Martinique, and contact Caribbean Spirits, Inc. to enjoy Neisson Rhum Agricole where you can savor history and exceptional quality in each sip. Read other articles on Martinique in the Destinations, Hotels and Resorts, Restaurants, Chefs' Recipes, Fashion, Gastronomy, Events, Liquor Cabinet and Travel News sections.